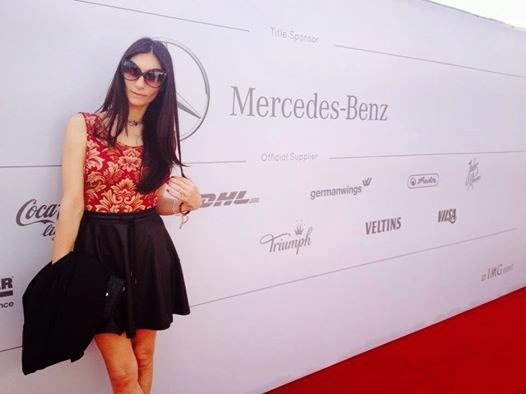 The Mora Smoothie fashion blog, DIY fashion by Paola Buonacara: DAY #1 Mercedes-Benz Fashion Week Berlin! If you follow me on socials network u have already seen that I'm in Berlin for the Mercedes-Benz Fashion Week. Arrived in Berlin I dedicated my first day at various fashion trade shows, but about this I'll tell in another post! Let's move on to my first day of shows, I attended the show by Anja Gockel, a real show, at the opening and closing have performed 4 dancers by the Deutschen Oper of Berlin and then the real fashion show inspired by Pina Bausch, strong woman with a strong character, where I was very impressed by the review of the jackets and the combination of colors and materials, and then the top dresses with prints... amazing! Following the fashion show by Franziska Michael winner of the "Premium Young Designers Award for Women’s Wear" in 2013, hers is a style with strong contrasts from the materials to the style, but from real impact for a real sporty chic. And then the fashion show by Glaw, where the mix of materials creates the true feast to create something amazing and then over to the dresses I was very impressed by the use of accessories, visors, headbands truly spectacular... I wanna them all ^ - ^ . My outfit for this first busy morning was a full skirt in vinpelle, alongside the amazing damask swimsuit by Ritienne Zammit, that created the look by just leaving bare shoulders. A big kiss and follow with me the Mercedes-Benz Fashion Week in Berlin on Twitter, Instagram and Facebook too! se mi seguite sui social avete già visto che sono a Berlino per la Mercedes-Benz Fashion Week. Arrivata a Berlino ho voluto dedicare il mio primo giorno alle varie fiere fashion, ma di questo ve ne parlerò in un altro post! Passiamo al mio primo giorno di sfilate, ho partecipato allo show di Anja Gockel, un vero show, in apertura e chiusura si sono esibite quattro ballerine della Deutschen Oper di Berlino e poi la vera sfilata inspirata a Pina Bausch, donna forte e dal carattere deciso, dove mi ha molto colpito la rivisitazione delle giacche e l'accostamento di colori e materiali e poi il top i vestiti con le stampe...fantastici!!! A seguire la sfilata di Franziska Michael vincitrice del "Premio Giovani Designers per Abbigliamento Donna" nel 2013, il suo è uno stile con forti contrasti dai materiali allo stile, ma di vero impatto per un vero sporty chic. E poi alla sfilata Glaw, dove il miscelarsi dei materiali crea il vero tripudio a creare dei veri spettacoli e poi oltre agli abiti mi ha molto colpita l'uso degli accessori, le visiere i cerchietti veramente spettacolari...li voglio tutti ^-^. Il mio outfit per la mattinata intensa era composta da gonna a ruota in vinpelle, accostata al fantastico costume damascato by Ritienne Zammit, che da solo creava il look lasciandomi le spalle scoperte. Un bacione grande e seguite con me la Mercedes-Benz Fashion Week di Berlino anche su Twitter, Instagram e Facebook.